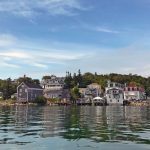 When you own a Maine island home, visitors ebb and flow like the tides. Crowds tend to roll in after Memorial Day and retreat when white-capped waves begin to churn up the water. Anticipating the fluctuations, and mindful of the pitfalls of too much togetherness, one property owner on Portland’s Little Diamond Island sought to create a home that could absorb varying combinations of guests, while allowing everyone a measure of privacy. 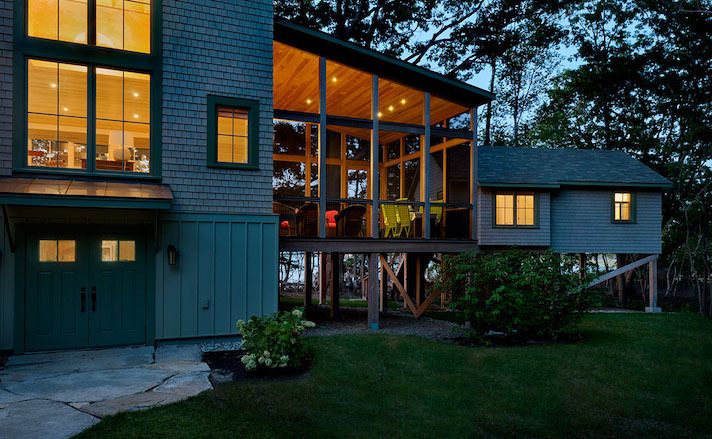 The resulting structure, designed by Vermont architect Sam Van Dam and constructed by Wright-Ryan Homes in Portland, consists of a winterized central volume for the owner flanked by connected seasonal buildings: a guest wing to the west and, to the east, a hideout for grandchildren known as the “Tree House.” Set atop stilts that conjure wharf pilings, the cottage appears to float among the property’s birches and oaks and provides spyhole views through the foliage of the comings and goings on the water. Breaking down the home into separate volumes for the owner and her guests allowed the team to work the building around the site’s 100-year-old oaks and effects a history, like the structure has been added on to over time, says Van Dam. Graying cedar shingles and pale-green trim create a kind of camouflage and oversize, paned casement windows (which resemble double-hungs but let in more of a breeze) “help the home tow the line between modern and traditional,” says Wright-Ryan project manager Don Hawkes, who worked with Attardo Pondelis Architecture in Yarmouth to execute Van Dam’s design. 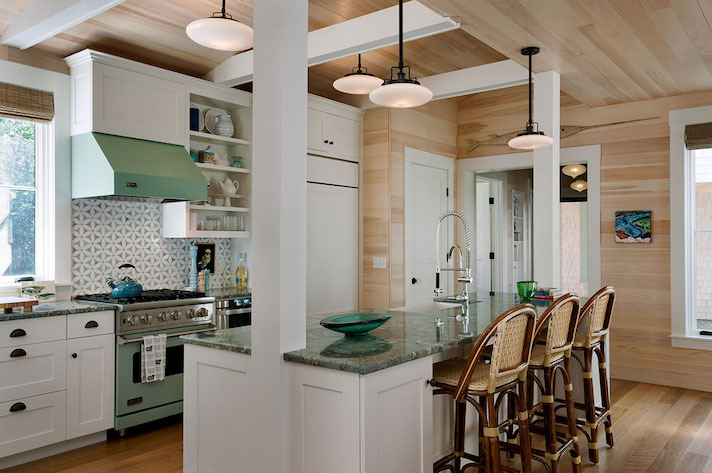 The kitchen is set off by structural columns and beams that support a shed roof overhead. 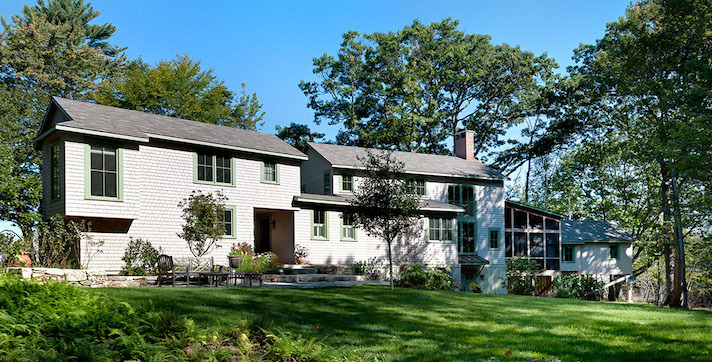 Jurassic granite countertops and a sage-green stove and backsplash reference the exterior trim and harmonize with the foliage framed in virtually every window. 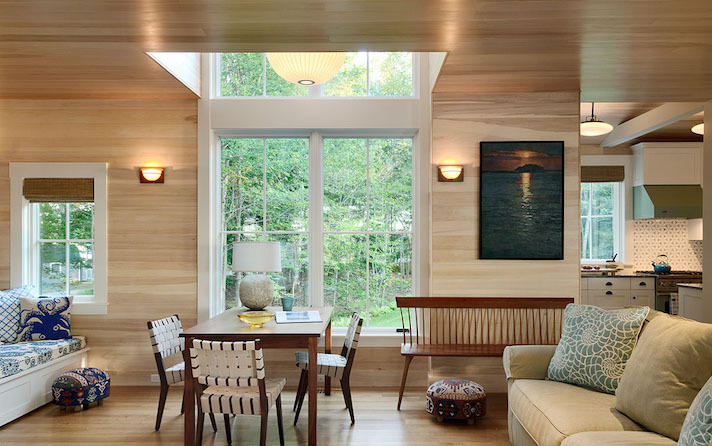 On the walls and ceilings throughout the home, select-grade white-pine paneling — whitewashed and polyurethaned for an airy effect and to prevent yellowing — creates a refined, cottagey look, while slightly darker quarter-sawn white-oak flooring provides subtle contrast and pleasing visual weight. A 16-foot-tall column of windows showcases the wooded landscape and beams southern light into the living area and a second-floor bunkroom. In the evening, the globe lantern, hovering over the darkened glazing, mimics the moonlit seascape in an adjacent painting. Seating configurations in the home, like its sleeping arrangements, are flexible. Between a long table studded with comfy leather armchairs in the dining area, the kitchen island, and smaller tables in the living room, on an adjoining deck, and on an expansive screened porch, the owner can accommodate intimate parties or dozens of guests. 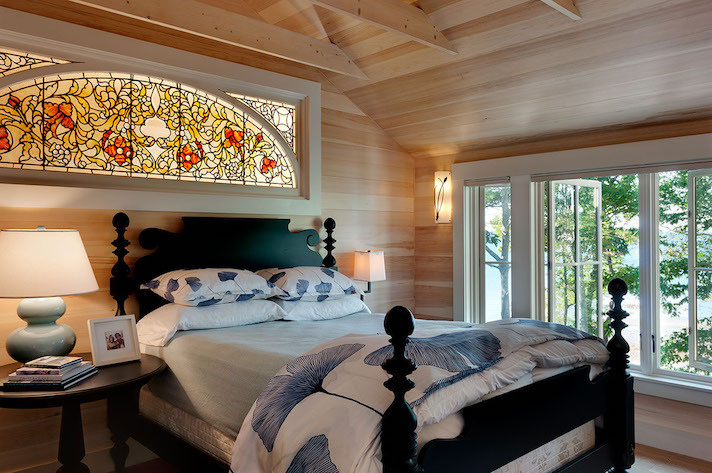 Hawkes’ team incorporated a salvaged stained-glass window, prized by the owner, into the vaulted-ceilinged master bedroom. Mounted on a stairwell wall, the glazing functions like a transom — bringing in light from the nearby space — and approximates a broad headboard. 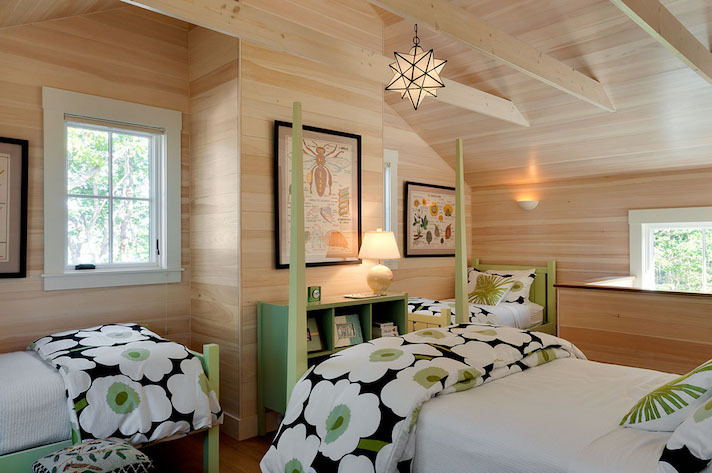 Located above the living area, the bunkroom appears primed for pillow fights and shadow puppets on the pitched ceiling. Younger kids can stay with their parents in the home’s western wing, which has its own living room, and older ones can hunker down together in the two-bedroom Tree House. 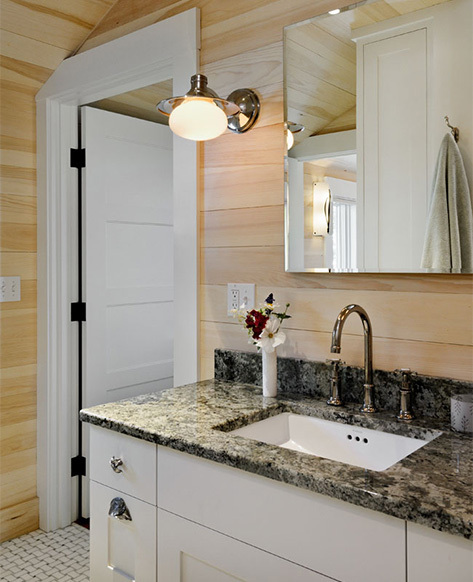 The master bedroom and bunkroom are arranged on either side of a shared bathroom featuring a custom vanity topped with Namibian Green granite and green-dotted Thassos marble floor tile. 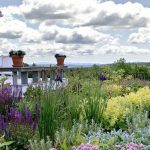 Terraced landscaping by Gnome Landscapes, Design, Masonry, & Maintenance in Falmouth helps feather the building into the sloped site. 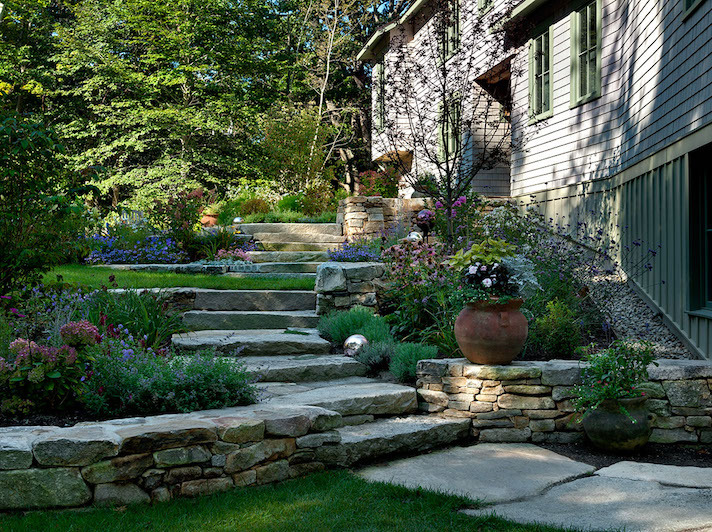 Tucked among the fieldstone retaining walls and weathered granite paths, garden beds brim with plants that attract pollinators, such as lavender, Nepeta, phlox, and Verbena bonariensis. Nuances of island life are reflected in design elements such as the lower-level storage area (above, left) for golf carts — the preferred mode of transportation on Little Diamond — and the piling-like supports beneath the screened porch and Tree House. In addition to referencing waterfront vernacular, the bracing helped minimize the number of trips the concrete trucks had to make when Hawkes’ team was pouring the foundation. Unlike visitors, who come and go on the ferry at all times of the day, these vehicles had to travel on barges just before high tide, then vamoose before becoming fixtures in the shallow water in front of the home. Why didn’t I have grandparents like these when I was growing up???? WHAT a life!!! 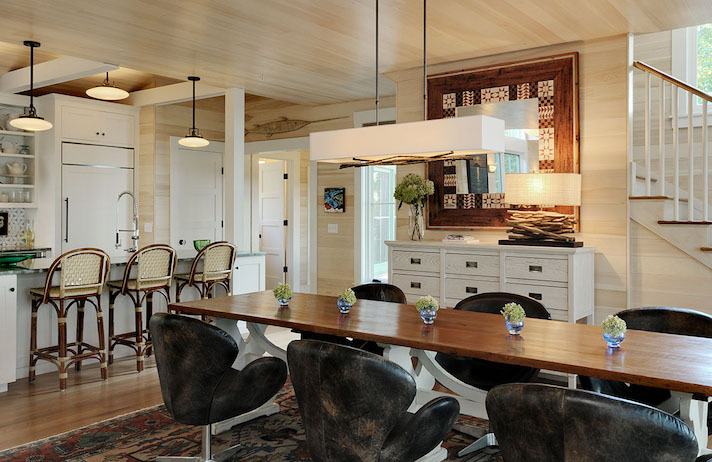 The interior finishes in this house are the most tastefully done finishes I have EVER seen. And that is a huge compliment from someone who does this for a living. Absolutely fabulous. If I was 50 years younger, I would beg these people to adopt me. What fantastic memories their grandkids will have and cherish for a lifetime at their grandparents’ spectacular home in a spectacular setting. My kind of house!! Exceptional job!! Susan — thank you for the kind words! I will pass them along to the builders, who really do the most amazing custom work. As someone with little kids, I am equally impressed by how much thought and care went into creating diverse sleeping arrangements that work for all age groups. Thanks again for taking the time to comment. It means a lot!